Dubrovnik, the southernmost town in Croatia, is probably more popular than Croatia itself. Vera grew up in this region, and knows the town pretty well. We'll try to cover as many aspects of Dubrovnik Croatia as possible. Dubrovnik is really beautiful, although at times it can feel too touristy (crowded, and expensive). However, Dubrovnik is one of its kind, and certainly a must-visit destination in Croatia. Dubrovnik has been UNESCO listed World Heritage Site since 1979. The most popular attraction in Dubrovnik is pedestrian-only old town and surrounding city walls. Dubrovnik is the southernmost town in Croatia, located only 50 km north of Montenegro. Below you'll find a map of Dubrovnik. You can click on the icon and read our posts about Dubrovnik landmarks, things to do, restaurants, etc. Dubrovnik.Is.Crazy.In.Summer. Remember that. Dubrovnik old town is small for the number of people that visits it during the summer. To enter the old town, you need to pass through town gates, and in summer you'll have queues even at town gates. Too much if you ask me. In spring and fall, there might be less activities and events available in Dubrovnik, but the town is so much nicer to visit. If you have a choice, visit Dubrovnik in spring or fall. If you have to visit it in summer, get mentally ready. The town is still beautiful regardless of crowds. Dubrovnik often makes it to all kinds of list of places you have to visit in your lifetime. The town is simply beautiful, and worth visiting. Enough said. Go, check it yourself! Dubrovnik is full of history. An UNESO World Heritage Site, the old town is perfectly preserved, and full of wonderful Renaissance, Gothic, and Baroque palaces, churches, and monasteries. Dubrovnik is often described as a museum town, but it's also a town full of museums. In Dubrovnik you can enjoy culture and art in all its forms: from music festivals, theater plays, art exhibitions to its architectural wonders. Yes, Dubrovnik gets crowded in July and August, and it can get overwhelming. However, Dubrovnik is one of those places with a great vibe, one of those places where you feel good and where you can stay all by yourself and never feel lonely. If you like to take on road in a pursuit of wonderful views, Dubrovnik Croatia is the place to go. You'll enjoy winding roads, endless vistas, small villages, hidden beaches, idyllic olive groves, and vineyards. Whether you visit Dubrovnik for a couple of days or for an extended period of time, you'll have lots of things to do and see. We've wrote two posts on things to do in and around Dubrovnik: Dubrovnik beyond the city walls, and Things to do in Dubrovnik, where we give you an in-depth insight into activities and experiences in Dubrovnik. Here we list just a couple of them. Less than four minute cable ride takes you up to the Srd Hill where you can enjoy wonderful views over Dubrovnik. There is a panoramic bar at the top, and a small museum. A charming walled city, Dubrovnik is a wonderful place to stroll, and enjoy the sights. Often considered a museum town, Dubrovnik is also a town full of museums. Many museums are small, dedicated to history of Dubrovnik, and the region. We particularly like a small ethnographic museum Rupe, and Gornji ugao tower. Wine is an integral part of life here in Dubrovnik. You can taste some of the best Croatian wines in many wine bars in Dubrovnik old town (we like D'Vino), but you can also take a half-day trip and explore vineyards in the Konavle region. We highly recommend visiting the Karaman Vinery. One of the most popular outdoor activities in Dubrovnik, sea kayaking is a half-day tour that takes you along the city walls south to the small cave beach, and off to the island of Lokrum. A fellow blogger Ashley shared her experience of sea kayaking in Dubrovnik here at our blog. You can also book this tour here. Sightseeing is easy in Dubrovnik, as majority of sites worth visiting are within the old town. You can explore sites on your own, or join one of guided city tours. Built in 1317, the Franciscan Monastery is located right at the entrance of the city, pass the Pile Gate. The monastery has two cloisters: upper and lower. The upper and lower cloisters. The lower cloister is built in Romanesque-Gothic, and it consists of 120 columns, and 12 pillars, frescoes, reliefs, statue of St. Francis, and a fountain. The monastery houses the old pharmacy from 14th century. Dubrovnik's main attraction, city walls are almost 2.000 m long, and consist of four fortresses: Minceta, Revelin, St. John, and the Bokar Fortress; two additional round towers, 12 square towers, 5 bastions, and 2 cornerstone forts. A must-see if you are in Dubrovnik. This 14-century fortress, built on a 37 m high sea rock, is often used as a stage for various theatrical plays. It was also a set of the “King's Landing” in the popular mini series “Games of Thrones”. The admission to the fort is included in the admission fee for the city walls. Yet, it remains less visited and thus less crowded. A lovely old port is located in the southern end of the city walls. Today it harbors small, leisure boats, and it's a great place to relax and watch the world go by. A green oasis just a short boat hop from Dubrovnik's old town, the island of Lokrum is a nature park, and a popular swimming spot among locals. Boats to the island depart from the old port. One thing you'll notice in Croatia is that restaurant offer is very homogeneous, menu of many restaurants resemble one another, and it can get a little bit boring after awhile. Luckily, this is not the case with Dubrovnik. 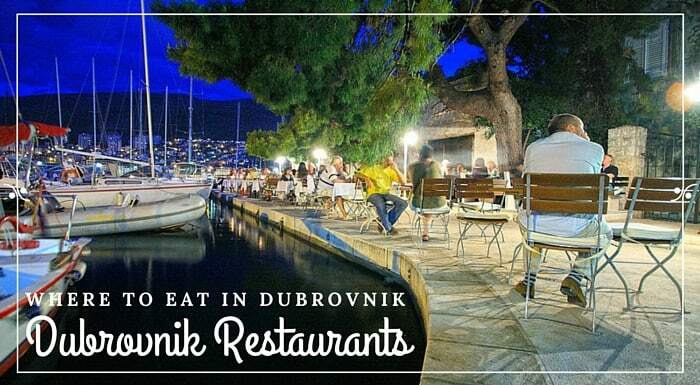 We've written a full post on best restaurants in Dubrovnik, and here we list just few of them. Not your standard sushi bar, but rather a modern fusion take on a sushi, sashimi and other seafood delicacies. The ingredients are as fresh as it gets, location is central, but yet quiet, and the service is friendly. Read our review here. Pantarul, located on a crossroads of two large streets out of the old town, is well-worth seeking out for its urban vibe, a variety of dishes and cuisines, and a super-attentive service. An upscale fish restaurant located in the heart of the old town, Proto serves classical Croatian seafood dishes. The restaurant is pricey, but offers a good quality, and top-notch service. A tiny restaurant, hidden in a small alley of the old town, Azur serves yummy dishes of non-traditional, and distinct Asian flavors. Their seared tuna is to die for. Croatians love their cafes and bars. 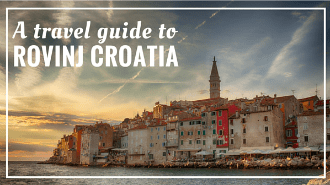 One of the first things you'll notice when travelling through Croatia – bars are always full of locals, lounging, and sipping coffee for hours. Dubrovnik is no different. Cafes and bars are everywhere. Tourists mostly hang out within old town, while locals equally frequent bars in the old town, and in other neighbourhoods, like Lapad. Located on the cliff above the sea, and accessible only through a passage in the city walls, Buza I and Buza II are the most popular bars among tourists. People love them for great views, and cool vibe. Drinks are pricey. We love D'Vino Wine Bar for its friendly staff, extensive list of Croatian wine served by glass, and a really cozy interior. Locals favourite bar in the old town, Galerie is located off Stradun, in one of the side streets, and it's famed for fun buckets-served drinks. A low-key bar located just off the Stradun, Fontana serves the cheapest drinks in the old town. One of the few bars in the old town still where locals still go. Other popular bars include Capitano, Art, Casablanca, Buzz Bar, and Afrika. Read more: Bars, clubs and nightlife in Dubrovnik. We always think of Dubrovnik in the sense of architecture, history, art, culture and food. But Dubrovnik is also a beach town where swimming, suntanning and just lazing in the sun is a l'ordre du jour. Locals head to the islands of Lokrum or Lopud, but also to Lapad peninsula for a day at the beach. A rocky Dance beach is also popular among locals, although the sea is a bit cooler here, it is still clean and has that wonderful blue color. Tourists mostly hang out on Banje beach for its proximity to the old town, and at Buza beach (popular for the cliff bars of the same name). Full post on beaches in Dubrovnik you can read here. READ OUR COMPLETE DUBROVNIK ACCOMMODATION GUIDE! Dubrovnik offers a good choice of accommodation: from 5-star hotels, vacation rentals, to hostels and even a campsite. Generally, the closest you stay to the old town, the more expensive your accommodation will be. If you travel by car, try to find an accommodation that offers free parking. Should you pay parking separately, it will significantly increase a cost of your stay. Hotels are more expensive than other types of accommodation, but have a breakfast included in the room price. All apartment rentals come with a fully-equipped kitchen, or kitchenette. This can help you lower your cost as you'll be able to shop for groceries, and cook your own meals. They are also a cheaper option if you travel with a bigger party, as the price is often set per apartment, for the full occupancy. Solitudo is the only campsite in the town, located at Babin Kuk neighborhood. Below you'll find a couple of recommended accommodation in Dubrovnik. Or head here to read our full post on best places to stay in Dubrovnik. Built on a cliff, overlooking the sea, island of Lokrum, and the old town, this boutique hotel features 56 contemporary rooms with large balconies. a spa center, a restaurant, and a private rocky beach. The villa is located 15 minute walk from the old town, and offers a free bus or boat shuttle to the town. Prices start from 200€ per double room with breakfast. Located just outside the old town, few steps from the Pile Gate, Grand hotel Imperial Hilton is set in a historic palace built in 1895. The hotel features 147 rooms and suites, gym, spa, indoir pool, bar, and restaurant. Views from upper floor rooms are great. A low-key 4-star property, hotel Argosy is located in the Babin kuk neighbourghood, 10-minute drive from the old town. The hotel is part of a popular Croatian hotel chain – Valamar Hotels & Resorts. It features 308 rooms, indoor and outdoor pool, and a couple of pebbly and rocky beaches below the hotel. Prices start at 73 € for a double room with breakfast. A property management company, ZigZag manages vacation rentals in Zagreb, Split, and Dubrovnik. ZigZag apartments are scattered throughout Dubrovnik old town. All apartments are located in historical buildings. Apartments are brand-new, modern, some feature old elements like vaulted ceilings, wooden beams, and exposed stone walls. Each apartment is air-conditioned, comes with a kitchen, or kitchenette, bathroom with shower, free WiFi, and a flat screen TV. Unfortunately, apartments don't provide a parking space. Prices start at 70 € for an apartment for two persons. Located in the heart of the old town, Fresh* Sheets offer six rooms with wonderful views over Dubrovnik landmarks, like Dubrovnik Cathedral, Rector's Palace, and famed Gundulic Square. All rooms are tastefully decorated, air-conditioned, and offer a free WiFi. Staff is super-friendly, and always eager to help with a suggestions, and money-saving tips (important!). Prices start at 188 € for a double room with a breakfast. Among tacky souvenir shops in Dubrovnik lining the main street Stradun, the cool and authentic stores aren't so easy to spot. We bring you our top three shops in Dubrovnik to check out. A place to find Croatian spirits, wines, cosmetics, sweets, postcards, ceramics and other artworks. A locally made and affordable accessories include necklaces made of red Adriatic corals. Parking around the car-free old town is a nightmare and very expensive. In this area, parking places are scarce, and expensive (expect to pay 40 kn per hour). If you plan to stay in Dubrovnik and you travel by car, make sure to book an accommodation that provides a free parking. Majority of hotels in Dubrovnik, located out of the old town, provide free parking, as well as many private apartments. Dubrovnik public garage is only 5-minute walk from the old town. Going down is easy, but coming back to the garage from the old town is all the way uphill. Parking in the garage costs 20 kn per hour. Parking lots and street parking are organized into five zones. Dubrovnik is the southernmost town in Croatia, and as such it's somewhat difficult to reach. Maybe not difficult, but it takes long time to get there regardless of your mode of transport. Traveling to Dubrovnik by plane is by far the best way to reach the town, at least from April to October when lots of low-cost carriers have direct flights to Dubrovnik from all major European destinations. Dubrovnik Airport is located near the village of Cilipi, 20 km south of Dubrovnik. It's a small, but modern regional airport. An airport shuttle bus depart frequently, after every scheduled flight. From Dubrovnik main bus station Gruz to the airport, a shuttle bus departs 2 hours prior to any international flight, and 90 minutes prior to any domestic flight. They also stop at the Pile gate, at the entrance to the old town. It takes 30 minutes each way, and one-way ticket costs 40 kn. You can also reach the town by public bus (bus station is on the main road, just outside of the airport parking). From April to October, lots of airlines fly into Dubrovnik from various European destinations, like London, Manchester, East Midlands, Leeds, Dublin, Vienna, Rome, Stockholm, Dublin, Amsterdam, Frankfurt, Warsaw, Barcelona, Madrid, Berlin, Edinburgh, Paris, and many more. Best websites to check flights to and from Dubrovnik are Expedia and Skyscanner. You can easily reach Dubrovnik by bus from many places in Croatia. Bus network is extensive, and buses are very reliable in Croatia. Many different bus operators have yearly connection to Dubrovnik. However it's not so easy to find information online. The largest bus operators are Croatia Bus, Autotrans, and Cazmatrans. The best way to plan your bus trip is to actually check at the central bus station once you are in Croatia. It takes about 9 hours by bus to reach Dubrovnik from Zagreb, and around 4 hours to reach Dubrovnik from Split. Expect to pay around 200 kn for a one-way ticket from Zagreb to Dubrovnik, 120 kn for an one-way ticket from Split to Dubrovnik. There is only one way to reach Dubrovnik, and it's via a coastal road D8 (ex. E65). This is a beautiful road that connects northern and southern Adriatic. It runs along the coast, and while it's winding, and scary at times, and it passes through too many villages, it also offers breathtaking views, and wonderful scenery. You can also take a highway going from north all the way to a town of Ploce in the south, but from PLoce, the only way to reach Dubrovnik is actually taking on that coastal road. It's mostly a single lane road for each direction, but at certain places it has a double-lane on one side (usually the ascending side of the road), and a single lane for the other direction. This road will also take you through Neum, the only coastal town in Bosnia & Herzegovina, that divides Croatia in two parts. You'll have a border crossing to and out of Bosnia, and you'll need to drive through Bosnia for about 10 km. Don't worry, if it wasn't for the border crossing, you wouldn't even notice it. You don't need any extra insurance to drive this part of the road. The area is considered a transit zone, and a car insurance for Croatia should be sufficient. Dubrovnik is a main ferry port for the nearby islands of Elafiti, Mljet, and Korcula. You can also reach Dubrovnik from Split by catamaran from May through October. The one-way ticket costs 180 kn per person. More info here. Dubrovnik can also be reached by ferry from Bari in Italy. The service runs from April through October. An one-way ticket goes from 300 kn per person. A car costs additional 400 kn per car. More info at Jadrolinija website. Driving in Dubrovnik can be a mess; especially when it comes to finding (and paying) parking. However, the town is relatively small, and it has a very good public transport. Buses run from 6 am to midnight, every 30 min or 1 hour depending on a line. The old town is car-free. One-ride ticket costs 15 kn if bought in a bus, or 12 kn if bought on a news stand. Daily ticket (valid for 24 hours, and unlimited number of rides) is 30 kn. You can also save money with Dubrovnik Card that gives you an entrance to 5 museums, 2 galleries, entrance to the city walls, and a number of bus rides. Dubrovnik card is sold as 1-day card (135 kn), 3-day card (180 kn), and a week card (225 kn). These prices include a 10% discount for online purchases. Since Dubrovnik has lots of direct flights from all over Europe, UK, and Ireland, many visitors to Croatia fly into Dubrovnik airport. Many of them don't plan on actually spending their entire holiday in Dubrovnik, but instead use it as an their entrance point for Croatia. They rent a car and travel further north. Many also stay in Dubrovnik but often rent a car for a day trips to surrounding area and sights. This means that Dubrovnik has a good choice of car rental companies, but it also means cars rent quickly in high season. We highly recommend that you rent your car well in advance if you plan to visit Dubrovnik in July and August. You can check Rentalcars.com website for the best deals, and price comparison. The earlier you book, the better price you'll get. Prices of car rentals vary according to car model, additional equipment, booking lead time, time of the year you're booking your car for, etc. You can expect to pay 60€ a day for a mini size car in a high season. The same car goes as low as 25€ in a low season. Our friends Robert & Mary, a Scottish couple who stay with my in-laws in Komarna every year, have a habit of renting the car for the consecutive year as soon as they come back home from this year vacation. And they pay as little as 10€ a day. Just to make you realize how important is to book early. If you would like to book your transfer from Dubrovnik Airport in advance, you can check availability and rates at Rideways website. This online platform offers instant booking for transfers with pretty flexible cancelation policy. Prices are similar to those found by Dubrovnik taxis (around 35 euro per person from Dubrovnik airport to the town or hotel), but when booking in advance you will avoid queueing with your fellow passengers for taxi. The last days of our holiday we stayed in Dubrovnik. This old city is just beautiful; it is listed on UNESCO list of World Heritage Sites. Old town is flocked by tourists though as it is one of the most prominent tourist destinations in the Mediterranean Sea. Despite the fact that is was crowded (and boiling hot) we did enjoy our two days here before flying back home. In Dubrovnik we stayed at Alberto Apartments which is beautifully located in the old town. The friendly owner is very helpful and the apartment is good value for money.